Sometimes your Internet Service Provider (ISP) provided modem does not give you the internet speed you are paying for. In most cases, you’d have a tech come out and investigate the issue(s). Most cases the tech will upgrade your old modem with a replacement modem or a newer dual band modem. But what if that still doesn’t do the problem? I’d really pester the ISP to ensure that my location can even reach near max internet speeds in my area. In my own personal experience, I was paying for AT&T’s Internet 24 speed, but then got a great deal on Internet 45. I ran various speed tests and noticed that I was getting less than 24 megabits per seconds (Mbps). I was supposed to get between 24.1 Mbps and 45 Mbps (in some cases up to 50 Mbps when wired connected and even wireless). The tech changed the modem to a dual band pace modem and from that time on, I have not experience any lower speeds than 24.1 Mbps (unless I was streaming multiple devices; that’s to be expected). Why KASDA Dual Band Wireless Router? To be honest I wanted to try out KASDA Dual Band Wireless Router because I wanted to see if I could attain or reach closer to 50 Mbps. In addition, the router was dual band like the Pace modem I got from AT&T. That meant that I had two frequencies 2GHz and 5GHz. It also meant that I could connect some devices to the KASDA router to try to “balance out” the internet speeds. My thinking was to put devices like tablets, and some streaming devices on the KASDA router and leave my primary devices such as iPhone devices on the Pace modem with AT&T. My first experience with the modem was satisfactory. The setup of the modem was easy to setup. The modem instructions and default login credentials are located underneath the modem. Once you get setup you can change the default login credentials to something you will remember. I would recommend setting up Guest accounts for guests. In case anything happens, you will not affect the devices on the main network. I really didn’t need the extra router for my home. I think that the Pace modem from AT&T would be just fine. It is dual band and I’m able to setup guest accounts and change the frequency settings (not recommended for beginners). What I need for my home is a wifi-extender to cover a wider area. 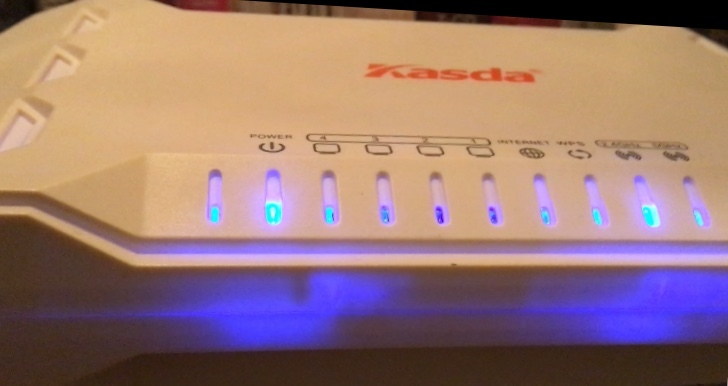 The KASDA Dual Band Wireless would work great as a replacement router if ever my main modem went out. Right now, I do have it setup to run a few devices. I’m monitoring to see how the KASDA router affects my speeds with the AT&T Pace modem. So far results have faired well and I intend on using the KASDA router as needed. I’d definitely recommend this modem for those who need a new modem or if you have enough cable to run the router to another room in your house to extend the wifi-coverage.